This software will help you migrate data from a Windows PC running Windows XP, Windows Vista, Windows 7 or Windows 8. The Migration Assistant will launch automatically after it has been installed. 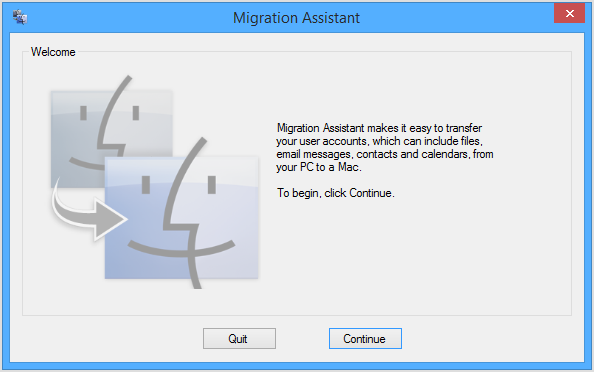 Windows Migration Assistant transfers your contacts, calendars, email accounts, and more from a PC and puts these files in the appropriate places on your Mac. Use these steps to make sure your migration goes smoothly. Use the check disk (chkdsk) utility on your PC to make sure there aren’t any issues with your Windows drive. Type cmd in the Run window and press Enter. Type chkdsk in the command window and press Enter. If the check disk utility reports that it found problems, type chkdsk drive: /F and press Enter (where “drive” is the letter that represents your Windows startup disk, like “d:”). Press the Y key at the prompt, then restart your PC. Repeat this process until the check disk utility reports no issues. If you’re unable to clear a reported disk issue, you might need to have your PC serviced before migrating your data to your Mac. 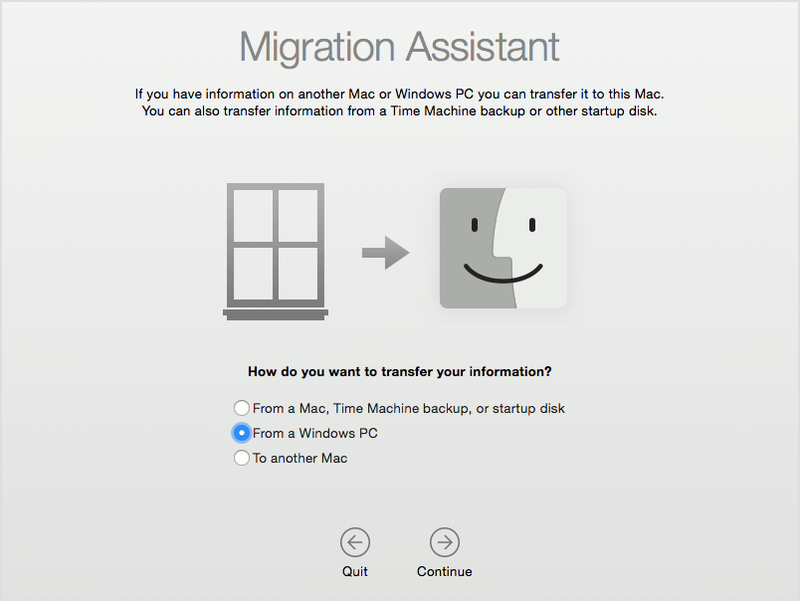 Use these steps to migrate data from a PC to your Mac. On your PC, download the Windows Migration Assistant and install it. Quit other open applications in Windows. Open Windows Migration Assistant on your PC. On your Mac, follow the onscreen prompts until you get to the migration pane of the assistant. Select the option to transfer information “From a Windows PC”. Click Continue to close any other apps that are open. Select your PC from the list of available computers in the migration window on your Mac, then wait for the PC to show the passcode displayed on the Mac. Click Continue on your PC and your Mac after you see the same passcode displayed on both computers. Your Mac scans the drives on your PC to build a list of information to migrate. 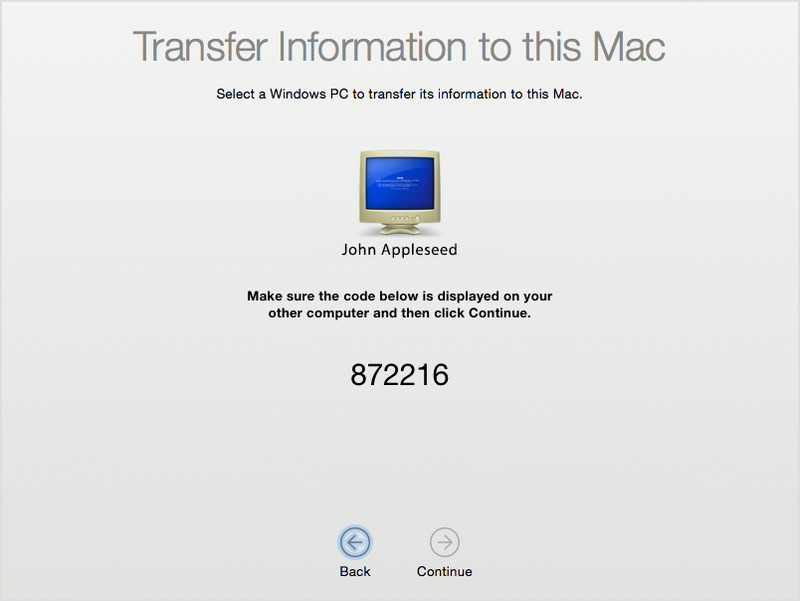 When the scan is complete, select the information you want to migrate to your Mac and click Continue. You can watch the progress and estimated time remaining on both the Windows PC and your Mac. Migration Assistant tells you when migration is complete. 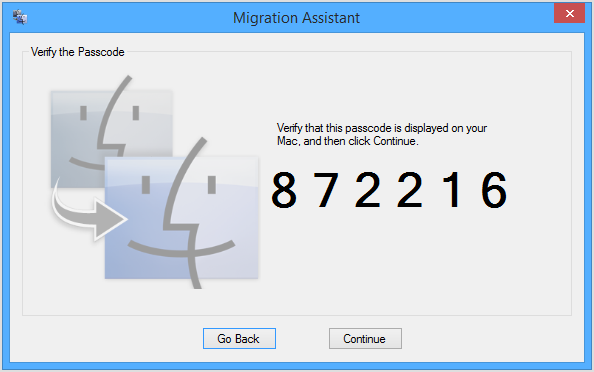 After migration is done, you can close Migration Assistant on your PC and log in to your new user account on your Mac. The first time you log in to a user account that’s migrated from a PC, you’re prompted to set a password. You can use the same password you used on your PC, or create a new password. See Choosing good passwords in OS X for tips on setting a password. Migration Assistant moves your email messages, mail account settings, contacts, and appointments, depending on which version of Windows you’re using and what kinds of accounts you have. Bookmarks from Internet Explorer, Safari for Windows, and Firefox are transferred to Safari. 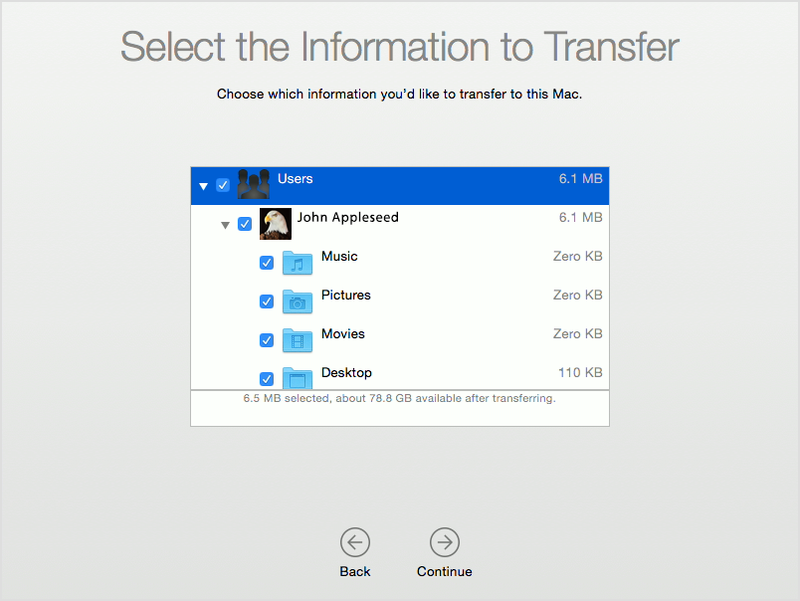 Your iTunes Music, Movies, and other iTunes library files are transferred to iTunes on your Mac. Photos and other images are copied to your Home folder. These files can be added to Photos. After migrating, you can open Photos and let it search your Mac for photos to import. Your language and location settings, web browser homepage, and desktop picture (other than standard Windows desktop pictures) are transferred to System Preferences settings in OS X. If the steps above don’t work as expected, check these things. If your PC doesn’t appear in the Setup Assistant or Migration Assistant window on your Mac, make sure they’re both connected to the same network. You can create an isolated network by connecting a single Ethernet cable between your Mac and PC. If Migration Assistant on your Mac still doesn’t list your PC, try disabling any Firewall software on your PC that might block network ports needed for Windows Migration Assistant to work. You can re-enable your firewall software after you’re done migrating. If Migration Assistant won’t open on your PC, temporarily disable any anti-virus software on your PC and try opening Migration Assistant again. You can re-enable your anti-virus software after migration is finished. If you’re unable to use Migration Assistant to transfer your files from your PC to your Mac, you can also manually copy your important data to your Mac using an external drive or file sharing.